Ideal for small and medium-sized vehicles, the Optimo K415 provides enhanced driving comfort and safety in wet weather conditions. 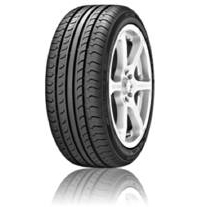 Constructed with a wide centre rib, this tyre achieves enhanced handling and short braking distances for performance you can rely on. In addition, lateral shoulder grooves work to prevent any decline in performance in wet conditions. The Optimo K415 delivers safety in rain thanks to its four channel grooves which optimally disperse water to achieve high aquaplaning resistance.